Only a short leg today – 21 miles to Mum and Dad’s near Bexhill-on-Sea. 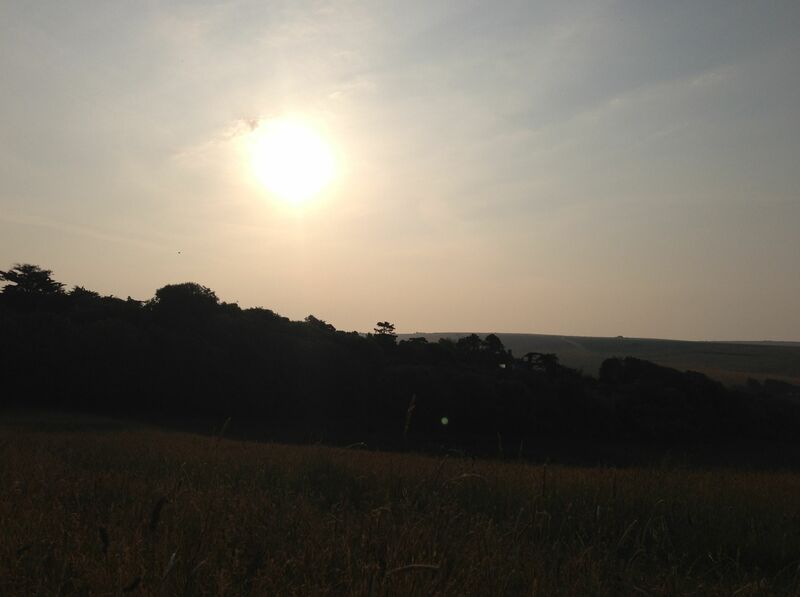 I slept pretty well in the meadow, cushioned by the long grass which had the slightly annoying side effect of inducing mild hay fever, but it was well worth it for the view in the morning. 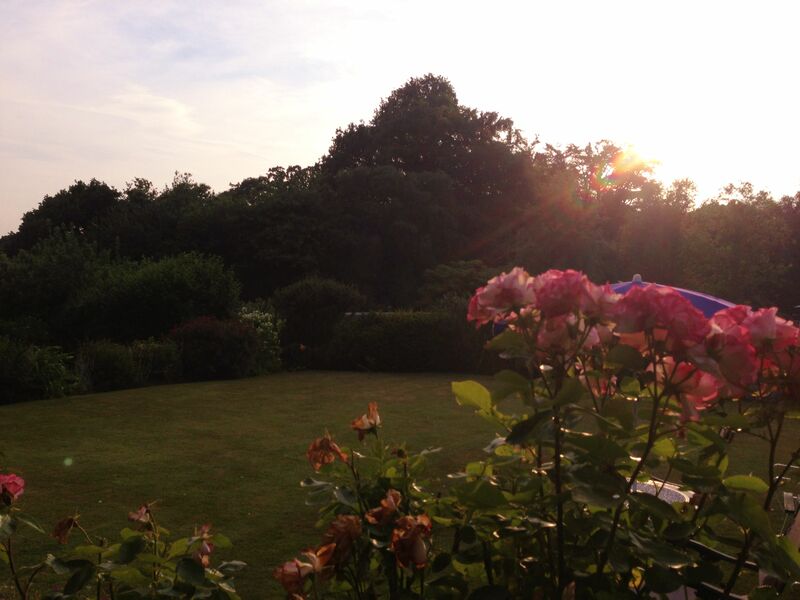 I woke up when it started getting light at about 05.00, took a photo, then went back to sleep again. I woke up again just before 07.00, in time to say hello to a dog walker wandering past who may have been slightly surprised by the two vagrants sleeping in a field, but didn’t seem bothered. 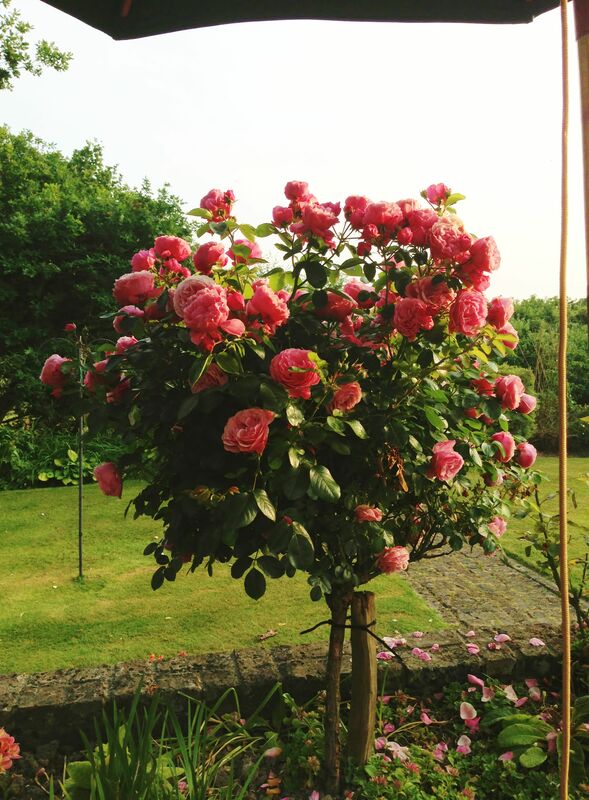 It was another beautiful morning, and I only had a short distance to go today before arriving at my Mum and Dad’s where I would stay tonight; free food and lodging always a bonus, and would be great to see them again. Ian and I packed up and were on the road by 07.30, riding down the grassy slope we’d pushed our bikes up last night. Ian had a much better descent than I, on his mountain bike complete with suspension, whilst I had a more bumpy and cautious ride down nervous of wiping out and sending panniers flying. 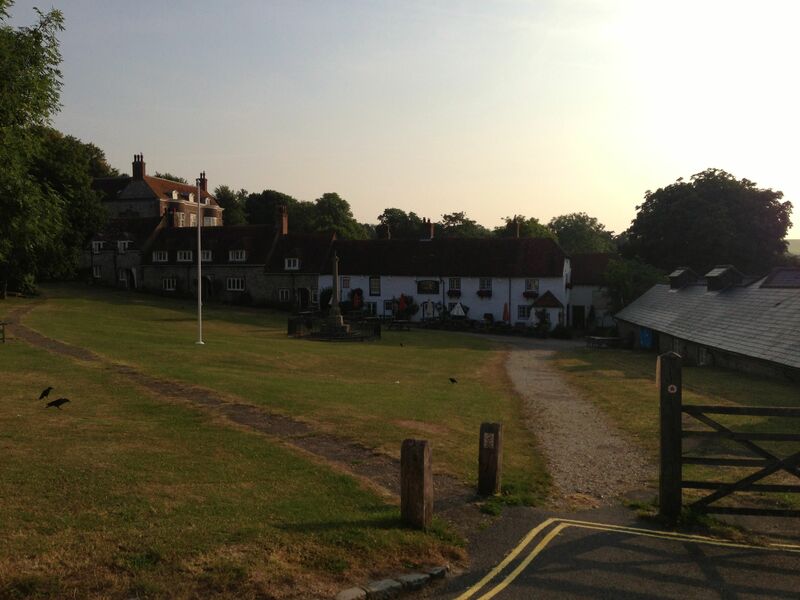 We both made it safely to the bottom and pedalled through East Dean, passing the Tiger Inn where we’d eaten the previous evening. 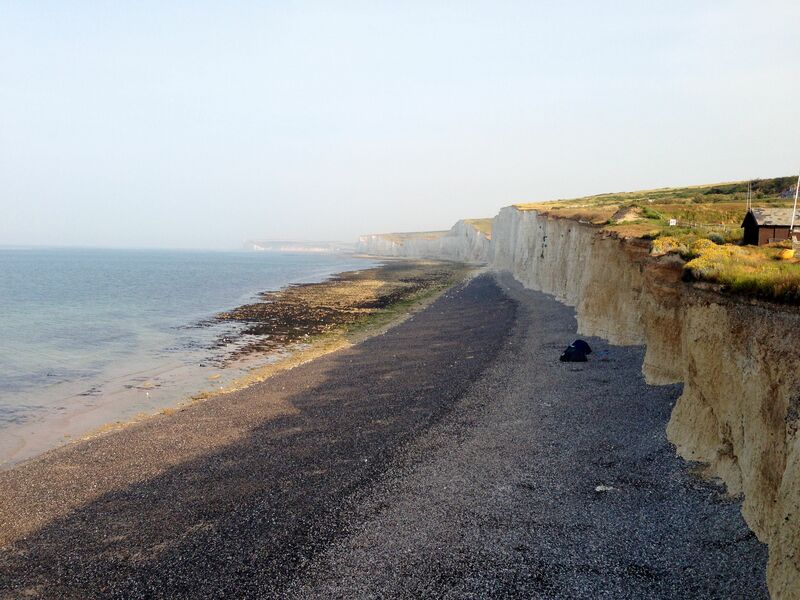 We headed to Birling Gap next, where more of the cliffs had fallen into the sea since I’d last visited. Judging from the bikes chained up at the top of the steps down to the beach, and the tents down on the shingle, this was where the cycle tourers we’d seen at the pub last night had ended up. They were taking a bit of a risk in pitching their tents in the lea of the cliffs, which have a tendency to drop rocks on the unwary. I still have a bit of rock at home that Lucy picked up a few years ago when we’d visited, because it had a nice piece of quartz in it; it seems like just yesterday we’d been walking along the beach, but at the same time ages ago because so much has happened since. 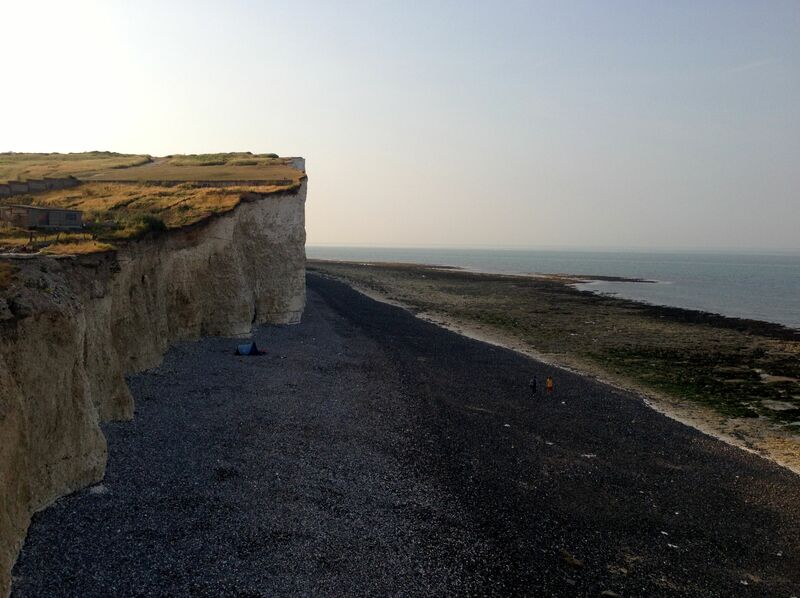 After a handy toilet stop we tackled a 500 foot climb up to Beachy Head and more great views. Beachy Head is unfortunately popular with people wanting to end it all by throwing themselves off the high cliffs, however thankfully no one was attempting such today. We did pass someone careering down the road on a road board type thing – lying down on long board with wheels, don’t know what they’re called but it looked fun if a little hazardous; luckily it was still early enough for there to be very little traffic on the road. There’s a Bomber Command war memorial at Beachy Head, and there was an older gentleman sitting next to it, obviously ex services. I could see a moisture in his eyes as he remembered past comrades and events, so quickly left him and his wife to their contemplation in the peaceful spot. The road down from the South Downs into Eastbourne was a lot of fun, a great descent if a little hair-raising as I tried to keep up with Ian. With the heavier bike I had to give myself more time to get around corners without the bike careering off into the bushes. We passed St. Bedes school where my Mum used to teach French, then stopped to look at Eastbourne College where I did my GCSE’s ‘several’ years ago. We rode along Eastbourne seafront to the Sovereign Harbour where we stopped for breakfast at the cafe; a much needed fry up since we hadn’t eaten anything as yet. As usual the marina was full of expensive looking boats. I prefer the sailing yachts to the motor cruisers, and have a long term ambition to take a year out at some point, learn to sail properly, and sail around the Mediterranean. I’ll have to save up quite a bit to realise this dream however it’ll stay on the list, and I’ll keep saving the pennies; once I get back to work that is. Over breakfast I chatted to Ian about possible plans for the next tour, having by no means been put off cycling by this one. I’d been mulling over cycling to Norway and the Arctic Circle, via Amsterdam. I reckon it would be great to pedal up long the coast through the Netherlands, Denmark, Sweden and Norway, across land bridges and using the occasional ferry, and taking in the fjords. The trouble is I’ve got lots of ideas for more tours; Cape Wrath to Sicily, coast of Ireland, around the Mediterranean coast, to New Zealand, and ultimately perhaps around the world. In the immediate future I might just do a few shorter trips into Europe to get used to cycle touring abroad. Ian was trying to convince me as to the merits of taking on the Tough Mudder challenge, which is an extreme assault course involving mud, dips in icy water, electric shops, 12 foot walls, crawling through tunnels and wading rivers, over something like 10 miles I think; sounds fun, sort of. Whilst I’m physically quite fit from cycling I’ll have to do some serious training for that one, involving running and perhaps visiting a gym – I hate gyms. Ian – I’m still not convinced it’s your best plan ever but I’m not ruling it out, I’m not clever enough to say no. After breakfast it was a pleasant ride along the coast through Pevensey Bay, where William the Conqueror landed his forces before defeating Harold at the Battle of Hastings, then on to Norman’s Bay. I grew up around here so it was all familiar territory, and Ian only lives just down the coast in Hastings. 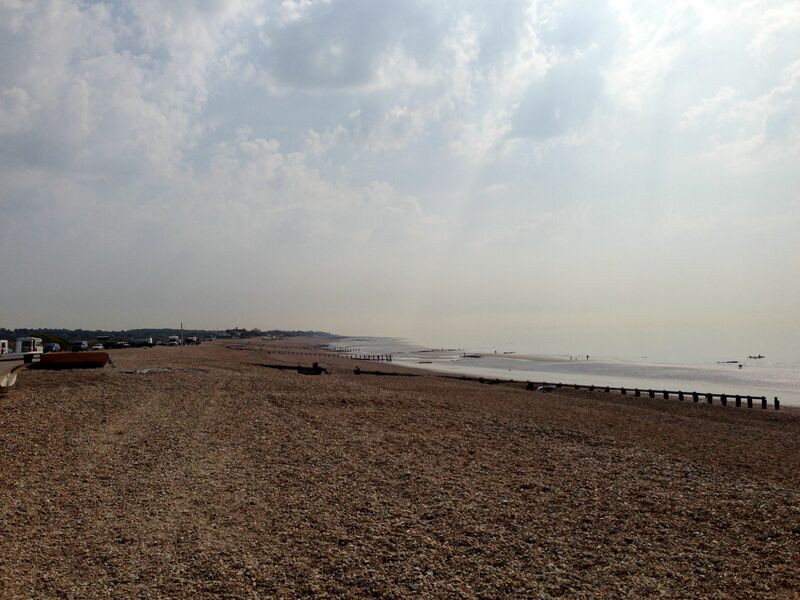 The day was getting hot so we stopped off for a swim at Herbrand Walk, near Cooden Beach. The sea was a lot murkier than it had been around other parts of the coast, the English Channel being sandy and muddy, and churned up by lots of ships. The water is however for the most part clean and it was a refreshing dip. We swam out to and around a buoy, and I thought I saw a dog swimming about 100 metres further out to sea. It must have been a seal as it disappeared from view, and it would be very unlikely a dog would have been that far out. The sea was flat calm, which is pretty strange for the English Channel and looked lovely. Usually there’s a prevailing South Westerly that whips up the waves, however the wind had been a North Easterly for the last week which was really odd, and was perhaps more evidence of climate change; it’ll be a cold winter if that keeps up. It also meant there were no windsurfers out today; usually it’s a popular spot due to the reliability of the wind. All in all a very refreshing dip, followed by a drink from the snack van and meeting up with my parents who had came down to meet us as they only live a few miles away. Ian had to shoot off back to Hastings as this point, to rendezvous with his wife Rachel and their kids for a party. I didn’t particularly envy him having to go to a kid’s party after two days of cycling and camping. Thanks for the company Ian! 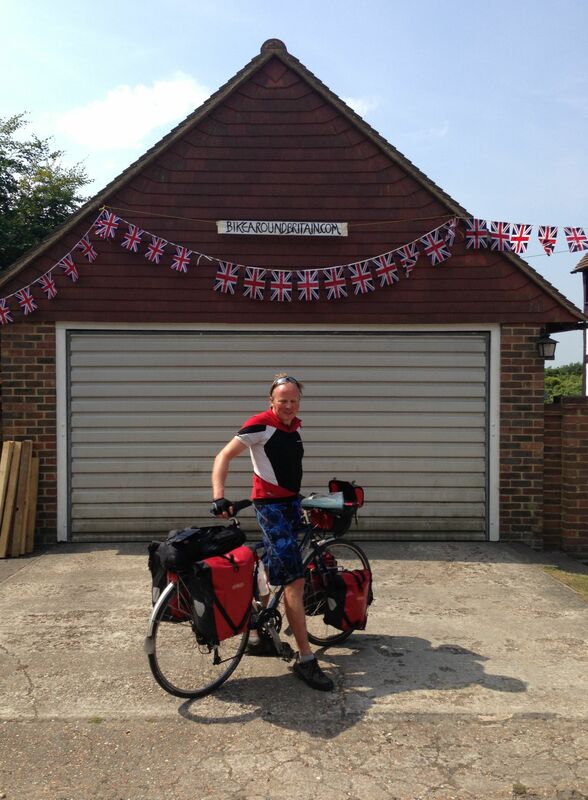 I cycled back to my parent’s house in Whydown, near Bexhill, arriving about 11.00 after covering just 21 miles. 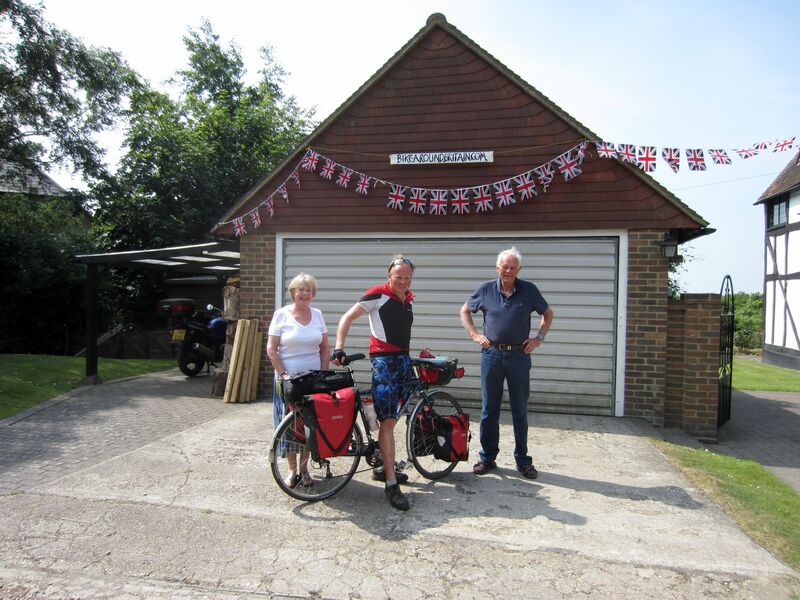 It was pleasant to have an early stop, and I was greeted by bunting and banners which Mum and Dad had erected to welcome me, with the help of the neighbours Steve, Di and Alex. It was great to see everyone and folks were generous with their sponsorship, including Darren from across the way. With only a week or so of the tour left it was a motivational boost to see everyone and get such a warm welcome, especially as I’d been starting to grow slightly apprehensive about finishing, and what it would be like to go back to a normal life. I wasn’t sure I’d find it very easy to return to the day job after this. After grabbing an early celebratory beer from the fridge I had a shower, lunch, and spent some time catching up on my journal in between snoozing. Dad and I also set about a bit of bike maintenance to make sure the Ridgeback was ready for the last few days of the tour. My next target was to reach the Latitude Festival by 18 July, which was only 4 days away, but all being well I’d make it in time to join up with the Tour de Latitude. I got in touch with the organiser Laura Pando to confirm I’d join them in Colchester, assuming I could get across the Thames. I had a lovely surprise as Laura had organised a free ticket to the festival, and one for a friend as well – amazingly generous and a gesture that would bring my tour to a great finish. I decided to invite Nigel, a friend from Norwich who’d started the tour with me nearly 3 months earlier, camping overnight in Happisburgh. I was really looking forward to the festival now, and meeting up with a load of friends. I spent the rest of the day writing, eating, chatting with parentals, and planning the last few legs around the coast. I decided to avoid London by getting the ferry across the Thames at Gravesend, even though I’d been tempted to cycle all the way in and across the bridge at Putney. I didn’t really have the time to cycle all the way into London, and it would be pretty unpleasant riding with all the traffic. Mum had cooked Roast Lamb for dinner which was an excellent result, and would set me up nicely for tomorrow, along with the ‘Pain Killers’ cocktail from Dad, a soothing remedy for tired legs, involving rum I believe. A whisky followed that later on so I was feeling pretty relaxed by the time I went to bed, and slept soundly looking forward to getting to Kent tomorrow. This entry was posted in Bike around Britain 2013 and tagged adventure, bicycle, bike, Bike around Britain, Birling Gap, charity, countryside, cycle, cycle touring, cycling, East Sussex, expedition, fundraising, outdoors, photos, South Downs on October 14, 2013 by SelfPropelled.